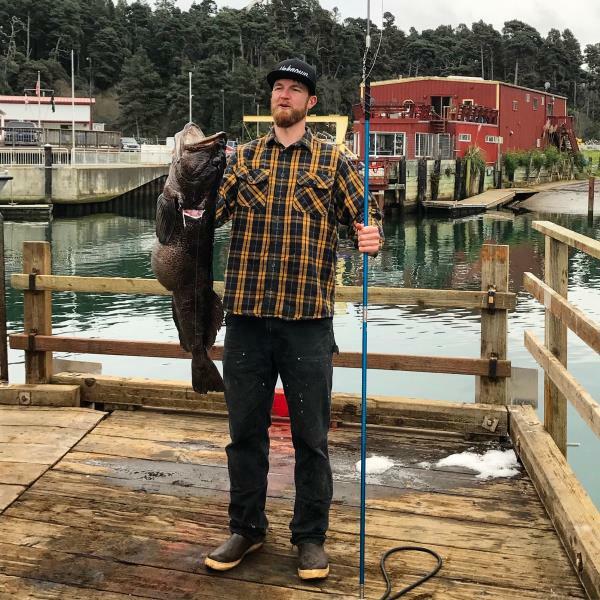 The ocean report looked like it was going to be very nice over the weekend right before christmas, so a couple buddies and myself decided to go and try to land some big lingcod with the pole spear. We made it to the boat launch and then it hit us. It was freezing outside! Not only that but the 10-15 mph wind chill made it feel even colder. We powered through the cold and launched the boat. It was about a 20 minute boat ride to the cove that was most protected from the little swell. We all hopped in and started hunting. I was about 400 feet from the shore and wasn't having much luck. I saw my buddy Justin diving near a rock that was sticking out of the ocean about 100 feet from the shore line and started diving my way over to him. About half way to him on a dive I came up to a large flat rock about 14 feet long and 8 feet wide in about 30 feet of water. I noticed a big tail hanging out of the entrance of a cave. I loaded up the pole spear and crept up to it. Once I got closer the lingcod started swimming into the cave, so I took the shot. I landed a solid shot right behind the head. The Lingcod took my whole pole spear and disappeared into the cave. I resurfaced to get air and just hoped I was gonna be able to retrieve the fish and my pole spear. I made some more dives on the entrance of the cave, I could grab the end of my pole spear but it was stuck and I couldn't see the fish at all. After a couple more dives around this big flat rock I found 2 more entrances to the cave. At one of them the fish was sitting there with the slip-tip fully engaged. I was able to grab the fish by the tail and bring it close enough to brain it with my knife. Now the hard part was getting my pole spear and fish out of the cave. Luckily, at the other entrance of the cave I could see where the cable slip-tip was wrapped around some rocks. After about 30 minutes of getting it untangled I was able to push everything back out the first entrance that the fish went into at the beginning. The whole process took me about an hour. Im extremely lucky there were 2 more entrances to the cave that i could reach into and was stoked to land such pretty fish on the pole. After all that I was tired and done. It was time to head in and get the fished weighed.